Switchvox, built on Asterisk, is Digium’s Unified Communications (UC) solution for SMBs. Each Switchvox IP PBX supports VoIP and traditional calling while also incorporating many key features to enable your business communications. Switchvox 360 IP PBX is easily provisioned with a GUI that allows you to configure multiple users and setup your entire system quickly. 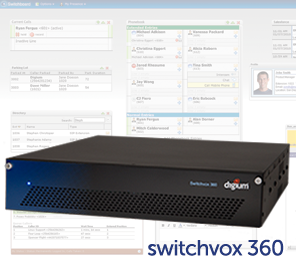 Switchvox 360 is ideal for larger businesses that want the high performance, highly redundant, full-featured rackmount PBX. Switchvox can be used in many of today’s applications where an IP PBX can be utilized. Here are some of the capabilities that are built-in to Switchvox Unified Communications systems and can be easily applied to your business applications.